In most states and under federal law, law enforcement can keep some or all of the proceeds from civil forfeitures. This incentive has led to concern that civil forfeiture encourages policing for profit, as agencies pursue forfeitures to boost their budgets at the expense of other policing priorities. These concerns are exacerbated by legal procedures that make civil forfeiture relatively easy for the government and hard for property owners to fight. For example, once law enforcement seizes property, the government must prove it was involved in criminal activity to forfeit or permanently keep it. But in nearly all states and at the federal level, the legal standard of proof the government must meet for civil forfeiture is lower than the strict standard of “beyond a reasonable doubt” required for criminal convictions. Likewise, many jurisdictions provide an “innocent-owner” defense that allows owners to get their property back if they had no idea it was involved in a crime. However, in most places, owners bear the burden of establishing their innocence. In other words, with civil forfeiture, property owners are effectively guilty until proven innocent. Guilty until proven innocent! It’s the American way. simply turn over seized assets to the feds and then take advantage of “equitable sharing.” This is a win for everyone: not only are looser federal rules in effect, but the money shared back to the states can only be used to fund law enforcement activities. What local police agency wouldn’t be thrilled? 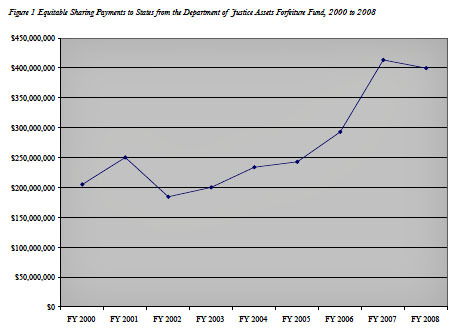 And as the chart on the right shows, the amount of money shared back to state law enforcement has skyrocketed over the past decade. The incentive for abuse is pretty obvious. The full report is here.